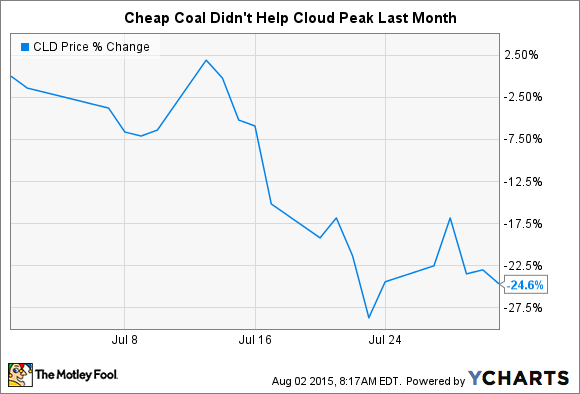 What: Cloud Peak Energy's (NYSE: CLD) stock fell almost 25% in July. That's a painful drop helped along by the bankruptcy and rumored bankruptcy of some of the coal industry's largest players. Indeed, if even domestically diversified giants can't survive, it isn't surprising that investors decided to limit their exposure to the entire industry. So What: Unlike the companies falling into bankruptcy, Cloud Peak doesn't play in the metallurgical, or steel making, coal space. That area is particularly troublesome right now. But that's only part of the problem facing the industry, since low natural gas prices and environmental concerns are pushing electric utilities to switch to alternative fuels. But, it means Cloud Peak isn't facing the same perfect storm that's creating such problems for others. And within the domestic market, Cloud Peak has a unique niche: it only mines in the Powder River Basin. This is one of the lowest cost coal regions in the country, giving Cloud Peak a competitive advantage over miners who also operate in higher cost regions, like the struggling Central Appalachia. That, however, is a far cry from saying Cloud Peak is dong well right now. For example, the miner sold less coal and at lower prices in the second quarter of this year than it did last year. It's results, were, as you might expect, notably weaker year over year. So there are problems at this Powder River basin giant. It's just that the problems aren't as big as at some other large domestic miners. Now What: There are better positioned companies in the coal mining space, and certainly anyone with a weak stomach should be avoiding this sector altogether. But, Cloud Peak does offer a unique focus on a coal region where demand is likely to remain solid over the long term because of the Powder River Basin's low costs. It is a notable difference between Cloud Peak and many of its prime competitors. So, if you are looking for a contrarian play, you'd be well advised to look at Cloud Peak. Even if you decide to take a pass, you'll gain some interesting knowledge along the way.